FREE storage and display in our riverside yards. FREE advertising in national boating magazines as well as on this site. We have found over the years that a realistic NET figure, mutually agreed, is the most simple and effective method of realising an efficient result, This allows us to "haggle" and to "throw in" goods / services if required, to achieve the sale without having to continually refer back to our clients. Also, our clients know exactly what they will receive from the sale without any unexpected deductions or charges. We have been successfully selling boats here for OVER 30 years. 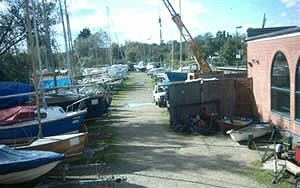 We have a unique and very well known location in the heart of this picturesque boating centre. Our clients come back time and again, both to buy and sell their boats through us. Perhaps we can be of service to YOU? Fill in the form below giving all the relevant information (for example, all sections if selling a boat, or just the engine section if selling an engine) OR print out this form to fill in and post. Take some photos of your craft, engine, trailer or equipment. In order to show that you are a genuine human being and not a computer, please enter the following (case-sensitive) text displayed from the image below. Where possible please enter sizes with units (so we know if you’re talking metric or imperial). Please ensure dates are entered as complete years. Please note that the age of the engine is required in whole MONTHS! Please check ALL details carefully before submitting this form. PLEASE NOTE: We act as brokers / agents only and whilst every care is taken in the preparation of these details, their accuracy is not guaranteed. These particulars are intended only as a guide and do not constitute a term of any contract. Prospective purchasers are advised, at their own expense, to have the above craft engines and equipment inspected by a qualified Marine Surveyor. * An inclusive NET figure is easier and fairer for both parties and allows for "haggling" etc. Please enter price in whole pounds only. Up to £500 . . . . . . . 25% inc. VAT. £501 to £1000 . . . . . . . 20% + VAT. £1001 to £3000 . . . . . . . 15% + VAT. £3001 to £5000 . . . . . . . 10% + VAT. above £5000 . . . . . 8% or by negotiation.